Description of "Network Dynamics of Knowledge Creation in the Wikisphere"
During casual meetings with acquaintances or over dinner table conversation with friends, when it came out that my research topic was “something to do with Wikipedia”, people’s interest would get piqued and the conversation would turn to what I was doing, what I was planning. As anyone who's been through a PhD knows, it is impossible to express the beauty, futiliy, grandeur, inadequacy, over a paper napkin at a dinner table. For some things in life, to synthesize is to lose the essence. So I took up a friend’s suggestion to make it available on www.pothi.com for anyone with sufficient interest and patience to acquire. 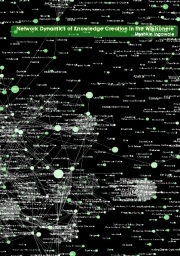 Reviews of "Network Dynamics of Knowledge Creation in the Wikisphere"